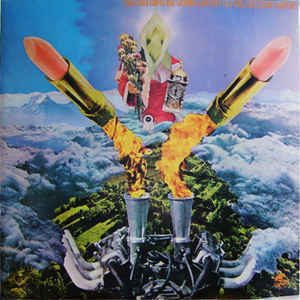 Death May Be Your Santa Claus is the second album by British underground group Second Hand. Released in 1971, parts of their music had also been used for the controversial 1969 film of the same name. The fact that Mott The Hoople had a track by the same name on their 1971 album Brain Capers is beyond coincidence after such a unique phrase. Their song doesn’t mention the title in the lyric which suggests that they might have ‘borrowed it’ plus the fact that Brain Capers was released in November 1971, nine months after Second Hand’s album and two years after the film where Second Hand appeared as themselves. Allegedly producer Guy Stevens suggested it as a ‘way out’ title for the song, obviously not telling them his source as they would have surely declined to use it, Second Hand releasing their album in April the same year. It’s an odd album of mixed influences, lots of grinding organ and freaky vocals, a free spirited ride through the transition period from the sixties to the seventies, sometimes jazzy, other times obscure and noisy, even electronic but also melodic, experimental, Zappaesque with touches of The Nice, Arthur Brown and with a playful Canterbury scene connection. Released on the short lived Mushroom label, original copies go from between £200- £500 (yes, I have a copy in my collection but I have no idea where I got it or what I payed for it, certainly not list price). I have a habit of buying interesting looking records by artists I’ve never heard of – sometimes you hit the financial and inspirational jackpot. CD’s and vinyl reissues of this record are available. If you want a madcap and unexpected journey full of surprises and creative abandon from an era where anything seemed possible, then this is the record for you (the CD boasts three extra tracks).